Cardinal Walter Kasper published another article in the run-up to the Extraordinary Synod on the Family advancing his proposal that the discipline of the Church forbidding the admittance of divorced and civilly remarried Catholics to the reception of Holy Communion needs to be cast aside. Kasper clearly includes himself among the “many people” reproaching the Church for hypocrisy. The claim essentially is: God is good and merciful, the Church is not when it prohibits all those living in “adulterous,” so-called second marriages from receiving the Holy Eucharist. The unwavering Eucharistic discipline of the Church, based on the clear teaching of Our Lord about marriage, is thus dismissed as a hypocritical betrayal of God’s mercy. the Church must proclaim the mercy of God; it must concretely provide people with God’s mercy in the form of the sacrament of reconciliation; and it must allow God’s mercy to appear and be realized in its entire life, its concrete structures and even in its laws. But Christian mercy does not consist in validating someone’s complaint of victimhood because the Church, in her discipline, is calling that person to repentance and fidelity to his word, given solemnly before God when he exchanged his marriage vows. The prohibition of the reception of Holy Communion by someone living with a person to whom he is not validly married is in fact a charitable act that upholds the Church’s doctrine concerning the reverence we owe to Christ present in the Holy Eucharist, and thus prevents the sacrilegious reception of Holy Communion and the attendant scandal that would commonly be given by such an act. Reception of the Holy Eucharist is here wrongly conceived of as a necessary public sign of fully belonging to the Church, hence its denial is treated as akin to an act of exclusion of that person from the Church. But those in invalid marriages are still in the Church; their persistence in a state of sin, however, means that they are not qualified to receive the Bread of Life. Their own public choice to enter into an adulterous union is the reason why they have excluded themselves from the sacrament of the Church’s unity, which they continue to wound in a serious way by their persistence in such a union. (It’s telling that in the early sessions of the synod, some are already calling for abandoning the term “adultery” as too harsh.) The denial of Communion may awaken the conscience. The Gospel call to repent and be converted means ending adulterous behavior by separating, or where that’s not possible or very difficult, by living as brother and sister. In case of doubt about the validity of a Catholic marriage, an ecclesiastical tribunal must decide if a case can be made for nullity. Yes, not only can we deny absolution, we must deny absolution until that person ceases to live in an adulterous union. Absolution cannot be given to someone who will not make a firm purpose of amendment to desist from his sins. Cardinal Kasper here characterizes the civilly remarried person as someone whose repentance is limited to ending the first marriage. That is not the only thing he needs to repent of. In fact, if he were not at fault in the break-up of his marriage, he cannot repent of what he did not cause. What must be repented of is ongoing adulterous behavior with a person to whom he not in fact married in the eyes of the Church. His “serious desire for the sacraments, which he needs for strength in his difficult situation,” requires him to turn away from all serious sin and make a good confession. Absent the integral confession of his sins and a firm purpose of amendment, he should not be given absolution. If he nevertheless approached the altar to receive the Holy Eucharist without having been absolved, that reception would provide no true “strength in a difficult situation” (apart, perhaps, from some chimerical psychological reassurance), but would rather be an offense against the holiness of the Eucharist and a true scandal, leading others to doubt the teaching of the Church on the indissolubility of marriage and the necessary dispositions for worthily receiving Holy Communion. Those who have made the fateful decision to enter into an invalid second marriage need our prayers, and our encouragement to reform their lives in accord with the demands Christ Himself has placed upon us. Cardinal Kasper’s proposal is a direct contradiction of the Church’s understanding of those demands. As such, it is a true distraction from the discussion the Synod needs to have about how to help divorced and remarried Catholics to encounter Christ once again – and lovingly embrace the demands of His Gospel. The Rev. Gerald E. Murray, J.C.D. 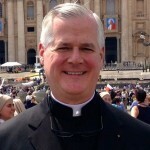 is pastor of Holy Family Church, New York, NY, and a canon lawyer.